​Soil is a dirty topic, but everyone needs to learn more about it! Soil is the foundation for many of the items we use in our daily life, such as food, clothing, clean water, homes and more. Healthy soil equals healthy food, which equals a healthy you. Don’t treat your soil like dirt! During the month of May Butte SWCD visited Arco and Mackay elementary schools with a presentation for the Soil and Water Conservation District's stewardship program. This year's theme was based on the importance on the way we treat the land in our watershed, as our daily habits can have a big impact on the water we drink. Over 200 students, from kindergarten to 6th grade enjoyed a presentation on the topic of "Watersheds-Our Water, Our Home" and then participated in learning about our EnviroScape. An EnviroScape is a three-dimensional landscape that illustrates residential, recreational, agriculture, industrial and transportation areas – all representing possible sources of water pollution. Did you know that only 1% of the water on our planet is fresh, useable water? The Butte SWCD appreciates the opportunity to go into the local schools and share the stewardship program each year. 2017 Stewardship- "Healthy Soils are Full of Life"
Butte SWCD visited Arco elementary school with a presentation and activity for the Soil and Water Conservation District's stewardship program. This year's theme was based on the importance of healthy soil. Approximately 200 students, from pre-school to 6th grade enjoyed a presentations on the topic of "Healthy Soils are Full of Life" and then participated in an activity to teach them about soil profiles. Each student created an edible soil profile by layering m&m's (bedrock), chocolate pudding (subsoil), crushed chocolate cookies (topsoil) and gummy worms in a plastic cup. The Butte SWCD appreciates the opportunity to go into the local schools and share the stewardship program each year. 2016 Stewardship-"We All Need Trees"
Throughout the month of May the Butte SWCD visited Arco and Mackay Schools with a presentation on “We All Need Trees". Over 300 students, grades Kindergarten through 6th grade, were given a power point presentation and learned about the importance of trees. The Butte SWCD would like to thank the schools for giving us the opportunity to bring our stewardship program into their schools every year. 2015 Stewardship-"Local Heroes-Your Hardworking Pollinators"
Throughout the month of May the Butte SWCD visited Arco, Howe and Mackay Schools with a presentation on “Local Heroes-Your Hardworking Pollinators". Over 300 students, grades Kindergarten through 6th grade, were given a power point presentation and learned about the importance of how insects, bats and birds pollinate 1 out of every 3 bites of food we eat every day. They learned about bee boards, that many kids have seen hanging around their own farms. How bees have sacks on their legs that they stuff full of pollen, these sacks full of pollen weigh as much as they do and are still able to fly. And how Cheetos and their messy orange cheese get’s stuck to them just like sticky pollen gets stuck to our hard working pollinators. The Butte SWCD would like to thank the schools for giving us the opportunity to bring our stewardship program into their schools every year. 2014 Stewardship-"Dig Deeper-Mysteries in the Soil"
The Butte SWCD visited Mackay, Arco and Howe elementary schools with presentations and activities for the Soil and Water Conservation District's stewardship program. This year's theme was based on the importance of soil. Approximately 300 students, from pre-school to 6th grade viewed powerpoint presentations on the topic of "Dig Deeper, Mysteries in the Soil" and then participated in an activity to teach them about soil profiles. Each student created an edible soil profile by layering m&m's (bedrock), crushed graham crackers (parent material), chocolate pudding (subsoil), crushed chocolate cookies (topsoil) and gummy worms in a plastic cup. The Butte SWCD appreciates the opportunity to go into the local schools and share the stewardship program each year. 2013 Stewardship-"Where Does Our Water Shed?" In the month of May, the Butte SWCD visited Mackay, Arco and Howe Elementary schools and made presentations on watersheds for the Soil and Water Conservation District's stewardship program. The stewardship program was presented to kindergarten through 6th grades. 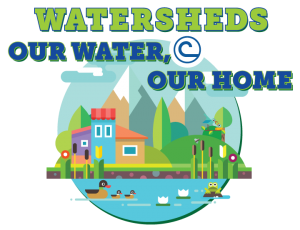 A powerpoint presentation was given describing what a watershed is and how to keep our watersheds clean, followed by a hands-on presentation with the enviroscape. The enviroscape is a small model of a watershed which allows the kids to see how a watershed works and the effects of pollution and erosion. Many thanks to the schools for allowing us to bring this program into the classrooms. 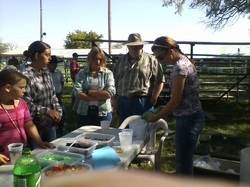 Loni Dowton, with the Custer Soil Conservation District and Teena Lord, with the Butte Soil Conservation District, presented Edible Aquifers at the Custer and Butte County Fairs. The fair goers enjoyed the process of making their edible aquifers while learning how pollution affects groundwater and the effect pumping has the water table. The edible aquifers were made up of ice and sprite representing the lower aquifer, ice cream for the confining layer, m&m's representing the upper aquifer, cookie crumb soil, gummy worms, sprinkles for the plant life and organisms, coconut for the grass, food coloring for the contaminant and straws for the well casings.